We have been busy! Unfortunately not with blogging. We’ve been teaching, always a black hole in terms of time. And when we’re not thinking about teaching, we’re thinking about our book, which, we regret to say, is not quite like writing the book. In short, we have once again become becalmed on many of the rocky shoals that litter our coastline (so to speak). But we have been doing some reading and we are extremely pleased to announce the settlement of a minor, nagging detail, just when did the Japanese start fishing in Alaskan waters? At some point, as a historian, you have to answer the basic journalistic questions (who, what, where, when, and why), as well as the historian’s question, so what? We’re always more interested in the so what, rather than the picky little details. But it is feels efficient to cover the details, like dates. So was it some time sometime in the 1920s? And surely the first fishery was for salmon? No. 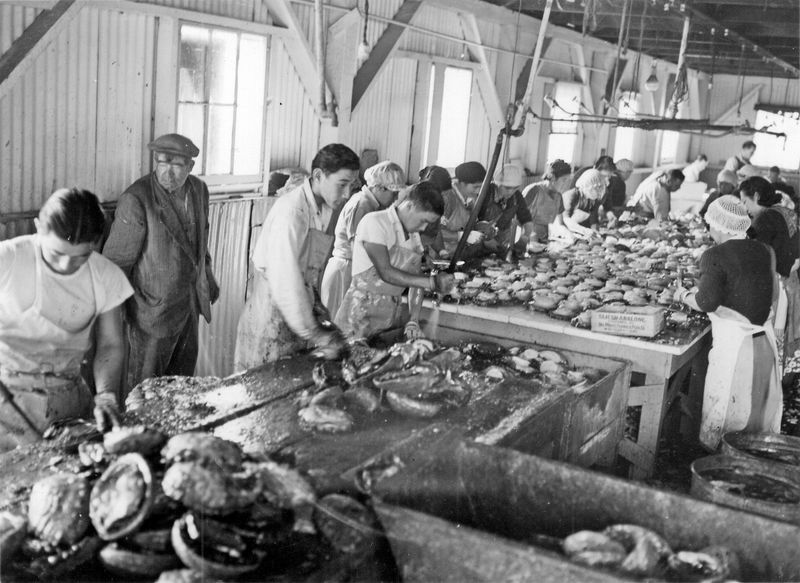 the first Japanese expedition to Alaskan waters was in 1929 and it was for king crab-crab that the Japanese would sell into the American market. During the 1930s, Americans would pay Japan $27 million for king crab that had been caught off Alaska’s Bristol Bay, which meant that the crab had, in essence, been American crab. Our source is a U.S. Fish and Wildlife circular from 1969, written by Philip E. Chitwood. He writes that the first trawling for groundfish off Alaska was in 1929, when the Japanese explored the eastern Bering Sea. That led to the development of a full-scale fishery in 1933. The Japanese caught yellowfin sole and walleye pollock, to reduce for fish oil and fish meal. They caught and froze Pacific Ocean Perch and walleye pollock. We have written quite a bit about this over the years. The conflict between American and Japanese fishermen really started in 1936, the year the Japanese attempted to expand their fishery into salmon. The West Coast salmon industry instantly unified and pressured the State Department to request that the Japanese government withdraw the proposal. The Japanese did so in 1937 and the conflict was lost in the wider issues that to Dec. 7, 1941. (This is all in our book, as well as it many other sources). The early commercial fisheries for king crab used tangle nets, which were eventually banned because they were too efficient, taking immature crab, never a good idea if you want your fishery to be sustainable. In other words, exploring for king crab required a scale of operation that was beyond the unorganized capabilities of the American fishing fleet in the 1930s. Americans fished the coastal waters, not the high seas. It took assistance from the federal government to start a fishery for king crab—and it had taken assistance from the Japanese government for the Japanese to mount their exploratory mission in 1929. This entry was posted in Carmel Finley, Fishing, History of Science, History of Technology, Japanese fishing, Maritime History, Ocean fishing, Pacific Fishing History Project, Sebastes rockfish and tagged Bering Sea, groundfish, History of Science, Jergen Westrheim, Pacific Fishery History Project, Pacific Ocean Perch, rosefish, trawling. Bookmark the permalink.